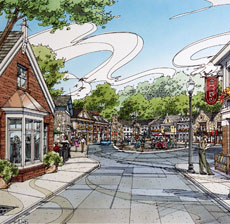 Weaver Sherman Design's clients include developers and communities who promote the redevelopment of established neighborhoods and the creation of new neighborhoods, town centers and overall communities into safe, walkable spaces. By focusing on New Urbanist design principles, we promote the efficient use of infrastructure and the preservation of natural habitats and farmland. Foremost, we work to preserve the natural characteristics of the individual site while creating an integrated relationship of buildings, streets and public parks, thus creating a unique, lasting place. Cookouts with the neighbors, greeting friends in the local park, waving at passersby from one's front porch - all of these are part of life in a classically designed neighborhood. Whether it be a product line for a builder who wants something fresh yet affordable or the special client interested in creative design, we design your home to be just as comfortable as the environment that surrounds it. Relating lifestyle to architecture, Weaver Sherman Design helps you build the home or community of your dreams.